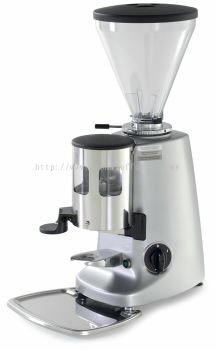 The Mazzer Super Jolly is perhaps the most well-known Mazzer grinder made. Its affordable price, incredible grind quality and durability have made it the premier choice for many small to mid-sized cafes. Even many home espresso enthusiasts have opted for this big-hearted beauty, noting the step up in speed and grind consistency between the 58mm burrs on the quite-respectable Mazzer Mini and the 64mm flat steel burrs on the Super Jolly. For those customers not wanting the size or needing the output of the Mazzer Major, the Super Jolly is the perfect choice. Stepless grind settings, including: espresso, drip coffee, and French press. Easy to use timer knob. Short Hopper available as an add-on in by selecting "Click for Available Options" above.